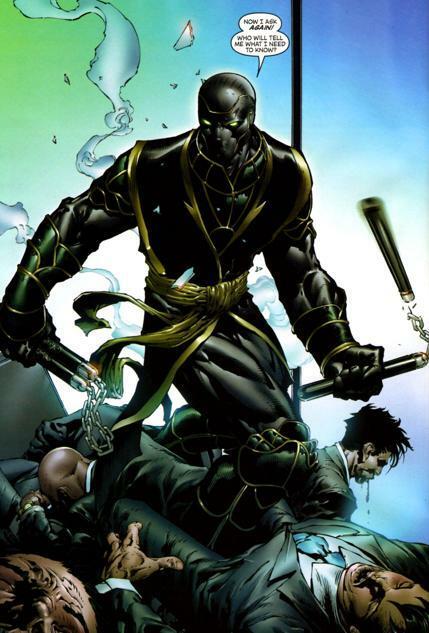 The story begins in as a mysterious Black, green and yellow clad warrior makes short work of a bunch of Yakuza. After defeating them the figure demands an answer to his question. Flashback to a meeting between Dardevil and Captain where he again tries to get DD to join his team. Back in the warrior from earlier expertly scale a moving train and then a large complex. The figure infiltrates the building by lurking n the shadows completely undetected. The warrior comes upon a meeting in the courtyard between the Silver Samurai and Hydra. Flashback to the cap and DD meeting, Cap still cant convince DD to join up but he recommends someone just as good as him for the purposes of the team. Before cap agrees he asks the identity of this person. In the present Lady Hydra/Viper greets the silver samurai with a kiss. As ninja close in on the warrior from behind. Flashback- Cap tells the unseen figure what plans he has for them, to locate Silver Samurai and report back and If a fight ensues not to kill. In the present the ninja and the warrior tangle, as the fight heats up even more ninja descend and the warrior has no choice but to kill or be killed. In the Japanese building of Stark Enterprises the new avengers wait on their new team member to arrive. He does and warns them of his failure after tangling with the hand. The hand ninja descend on the team after mowing down the warrior with shuriken. Apart from the mystery we got a healthy dose of story and action mixed in sure to keep any kind of comicfan happy, action junkie or otherwise. I also loved the mounting mystery surrounding the prison break and silver samurai’s clan yashida/ hand alliance + Hydra. At the time this was a very scary and formidable alliance in the making and we do eventually get a hydra/hand alliance and all those seeds are planted right here. Minor nitpick….where is the sentry?